Anticarbon-14 and Oxygen-18 Nuclei: What If They Collided? And Then, What About the Reverse-Reaction? Two protons and two neutrons, of course, can exist as separate particles, two deuterons, a tritium nucleus and a neutron, or a single alpha particle. Now, consider this: any physical process is, at least hypothetically, reversible. Therefore, it should be possible to bombard a dense beam of alpha particles with many gamma rays, each of a specific and calculable energy, and, rarely, the reverse reaction would occur, and anticarbon-14 and oxygen-18 nuclei would appear. Oxygen-18 is stable, but rare, so detection of it would be evidence that the reverse-reaction had occurred. Anticarbon-14, however, can logically being expected to decay to antinitrogen-14 via the antimatter version of beta-negative decay, which, it being antimatter, will result in the emission of an easily-detectable positron. It likely will not have time to do this, though, for carbon-14’s half-life (and anticarbon-14’s as well, one assumes) exceeds 5,000 years. 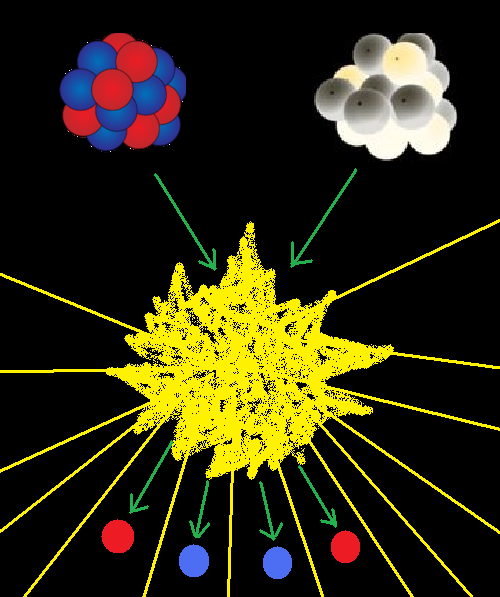 The more likely scenario for the anticarbon-14 nucleus is that it will create a large burst of gamma rays when it encounters, say, a non-antimatter carbon atom — and these gamma rays would come from a different position than the ones bombarding the alpha particles, and can therefore be distinguished from them by determination of their direction. Such a reverse-reaction would be quite rare, for it involves a decrease in entropy, violating the Second Law of Thermodynamics. However, the Second Law is a statistical law, not an absolute one, so it simply describes what happens most of the time, allowing for rare and unusual aberrations, especially on the scale of things which are extremely small. So, do this about a trillion times (or much more, but still a finite number of trials) and you’ll eventually observe evidence of the production of the first known anticarbon nucleus. Also, before anyone points this out, I am well aware that this is highly speculative. I do make this claim, though: it can be tested. Perhaps someone will read this, and decide to do exactly that. I’d test it myself, but I lack the equipment to do so. This entry was posted in Science and Scientists and tagged antimatter, particle, physics, science, speculation, speculative by RobertLovesPi. Bookmark the permalink. I don’t think I would want to be near when this is tested. I have a physicist friend who works at Fermi. Maybe he’d give it a shot.